What Is the Landscape of the Tundra? What Causes a Tundra to Form? From the Finnish word for treeless plain, tundra describes some of the harshest climates on earth. Arid and freezing with poor soil and short summers, life barely thrives in these unforgiving environments. With annual precipitation levels the same as some of the driest deserts, the arctic tundra is as beautiful as it is unforgiving. It is important to note the distinction between alpine and arctic tundra. Alpine tundra are defined by altitude as opposed to precipitation and temperature like arctic tundra. Alpine tundra are located at the tops of mountains, above the tree line. Depending on the mountain and the region, this can be anywhere from 10,000 feet and higher. Alpine tundra are characterized by freezing nighttime temperatures, high winds and, in some areas, heavy snowfall. The arctic tundra includes the area around the North Pole from Siberia in Europe, to most of Alaska and about half of Canada. The Antarctic peninsula is also considered an arctic tundra. These areas have short growing seasons, usually only from 50 to 60 days. Temperatures range in the summer from minus-three to minus-12 degrees Celsius and around minus-34 degrees Celsius in the winter. Including melting snow, precipitation averages six to 10 inches annually. The tundra is also characterized by permafrost, a layer of land averaging 12 inches in depth. 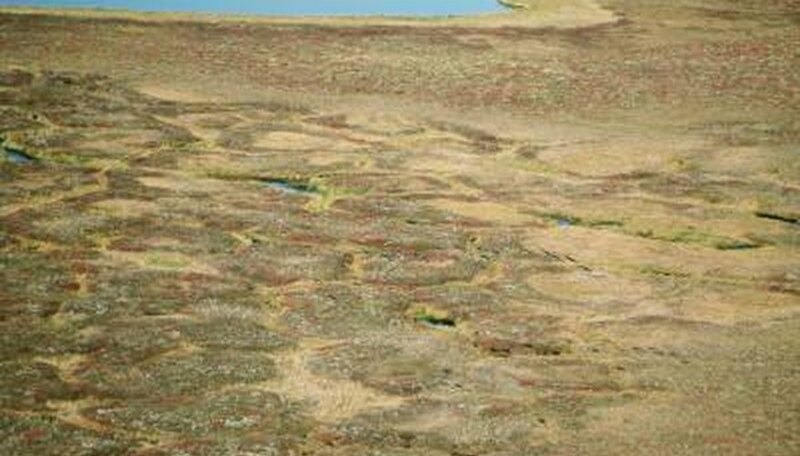 During the short summer, a small amount of rain falls and temperatures rise enough to melt the top layer of permafrost. As a result, the ground becomes soggy and marshy. While it is not a diverse ecosystem, there are flora that thrive in the arctic tundra. Low shrubs, mosses, lichen and even some flowers grow in the melting permafrost. Due to the high winds and frozen soil, trees cannot survive in the tundra. During winter the bogs and marshes freeze, adding layers to the permafrost. The polar anticyclone is caused by descending cold air at the polar latitudes. Cold air is denser than hot air and "sinks" or subsides causing high atmospheric pressure and resulting in cooler, drier air. Divergence, or the outflow of horizontal winds also moves or holds this cooler and drier air downward. These forces combine to create a freezing desert. The arctic tundra’s permafrost is made up of soil and frozen organic matter, like plant material. Plants take carbon dioxide from the air and when they die and decompose it is released back into the air as carbon dioxide and methane. The plant matter in deepfreeze under the tundra could pose a threat to the atmosphere if global temperatures continue to rise and permafrost begins to melt. The plant matter frozen in the soil will begin to decompose and release its trapped carbon dioxide and methane into the atmosphere, possibly increasing the effects of global warming. Monks, Melissa. "What Is the Average Rainfall for a Tundra Climate?" Sciencing, https://sciencing.com/average-rainfall-tundra-climate-5070302.html. 24 April 2017.